Screams, a sword fight and a stunning princess waiting to be rescued - it's not often that one sees such scenes in a wedding video. But Sneha and Amrit's wedding ceremonies included a party and a short skit inspired by the Pirates of the Caribbean movie. Shot at the Shangri-La Mactan Resort & Spa in Cebu, in the Philippines, by Malaysia-based Doodle Studio, their wedding video captures the many moods and moments of this destination wedding evocatively. The sprawling, stunning sea-facing location is captured effectively, from its long boardwalk during sunset to its magnificent gardens, inviting pools and grand halls. There's humour as the groom's mother addresses the gathering and warns the new bride of her husband's habit of spending a long time in the shower. Amrit, the groom, takes everything sportingly, and Sneha beautiful smile lights up the screen in every frame. 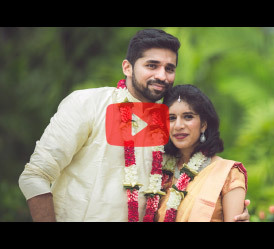 The good looking couple's love story began when they became friends on Facebook and Sneha reveals her side of their love story in charming sound bytes. Amrit voices his undying love for Sneha unabashedly on camera and his confident charm and bonhomie is captured in shots with his friends, family and his bride. The cinematic video does not follow a linear narrative, rather it mixes and blends images, emotions and excitement from different phases of the wedding, be it the arrival, pool parties, traditional rituals, pheras and reception as the cameras pan around, zoom in or focus on some important detail or delightful smile of the wedding. The music tracks through the video transition from Hindi to English smoothly as do extreme close-ups of Amrit getting ready or Sneha looking into his eyes with long shots encompassing all the action. Then there is the usual but watchable scenes of revelry and 'masti' that is characteristic of every Indian wedding. An elderly guest doles out advice in one shot saying couples should say 'I love you' to each other every day, as the gathering erupts into boisterous dancing, and that's how we wish Sneha and Amrit enjoy their married life.